Nokia on Sunday hinted that Microsoft essentially won a bidding war against Google to supply software to the world's largest handset maker. It also suggested that the first phones running Windows Phone software are likely to come out this year. the Mobile World Congress starts. He referred to a slide that Nokia displayed last week that showed marketing and other investments flowing from Microsoft to Nokia as part of the deal. While speculation has had that number in the millions or tens of millions, it's more than that, he said. "In fact the value transferred to Nokia is measured in B's not M's," he said. Nokia went with Microsoft because it creates a very different dynamic in the market, he said. "We have created a three-horse race," he said, repeating a comment that indicates he discounts the impact of Research in Motion's Blackberry platform. Nokia reiterated that it plans to continue to support developers who are building apps for Symbian, since there is a very large base of existing Symbian phones and more to come. It hopes to execute a smooth transition between Symbian and Windows Phone. Also, it plans to contribute some of its development of the Ovi store as part of the partnership. Nokia has partnerships with over 100 operators so that end users can pay for purchases in the Ovi store on their wireless bill. That capability will put Windows Phone and Nokia ahead of both Apple and Android. 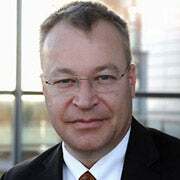 In addition, Elop said that there could be multiple stores, such as the Ovi store and Microsoft's Marketplace, and that the Ovi store would offer all the apps available in the Windows store.